Picture this: A group of strangers walk up to your doorstep and stick or nail posters. Such a treatment is meted on a daily basis to thousands of trees across India and unfortunately the trees cannot even raise a voice. Understanding the plight of trees, a few environment-conscious citizens in Bengaluru are on a mission to help the trees live. 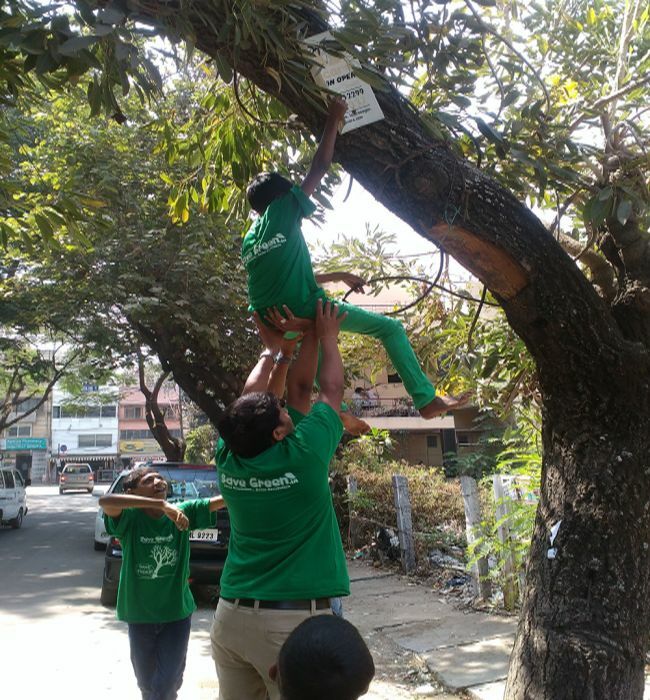 City-based Save Green NGO, which was started in 2009 to plant trees, recently shifted its focus to the posters, ads, hoardings and ferry lights suffocating the trees. Their aim is simple – to remove anything that is punched into a tree by a human. In course of our mission to plant trees, we realized that merely planting them is not enough. The whole purpose is defeated if the trees are not taken care of properly. Besides the problem of posters, cementing corners of the trees is another silent issue that is hampering the health of the trees. As per Save Green, many shops, especially the eateries cement the area outside the shop to create seating areas for the customers. While concretizing the footpaths, they often end up cementing the corners of the trees. A minimum of 2 feet of space should be given to the tree so that there is space for mud and water to percolate to the roots properly. The shop owners cement the trees without any permissions. It is strange to see how they are carving out places for humans to sit at the cost of trees, which by the way supply oxygen to humans, adds Hemant. Previous Post: 5 Simple Ways To Reduce Waste At Home. Next Post: This Bengaluru-based NGO converts discarded plastic waste into colourful and cheap tiles.